One or more photo(s) has been virtually staged. PRICE IMPROVEMENT 9/14 and NEW STAINLESS STEEL APPLIANCES!! Established community of Boyette Farms tucked away on a quiet cul-de-sac. True split plan with lots of room to spread out and for family to live comfortably. As you walk in to the foyer, the breakfast nook and kitchen are on your left and the living/dining are on your right. At the end of the hallway is a large family room with triple sliders to the covered lanai. These rooms all have spacious 11+ ft ceilings and classy bullnose wall corners. Master Bedroom is large and has a spacious master bath with dual sinks, garden tub and large shower with 2 large closets. This home has 4 bedrooms and 3 bathrooms. 4th Bedroom could easily be a guest suite or in-law quarters with proximity of 3rd bathroom. Partially Fenced. 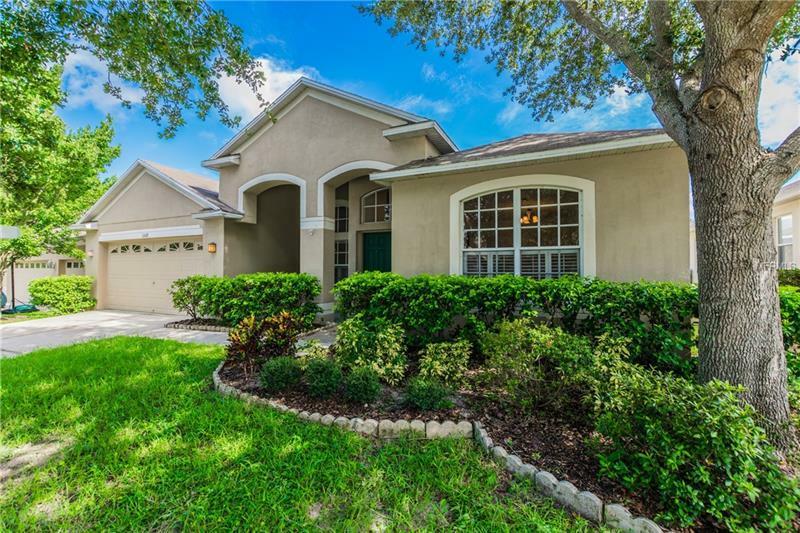 Close to shopping, restaurants, schools, Selmon Expressway and lots of activities. Easy commute to MacDill AFB. Virtual Photos have been added to show you how home will look furnished.